If you grow your own fruit you may be interested in storing some of it for use later on. This could be because all of your fruit becomes ripe all at the same time or because you have a particularly good harvest, one year, called a glut. The best fruit to store are apples and pears. Other fruits don’t store as well and should be kept in the fridge for up to four weeks, or dried, or frozen. Only store fruit of the best quality. Fruit with blemishes or wounds won’t store well, and could actually encourage the rest of the crop to go bad as well. Fruit is best stored at a regular temperature, ideally between 3-7°C. They need plenty of ventilation, and store for longer if kept in the dark. A garden shed, cellar or garage are ideal places to store fruit. Fruit should be stored in containers, which should allow air to circulate around the fruit. A good example of a container suitable for storing fruit is a crate that you can stack onto other crates. Other examples include slatted wooden shelves, orchard boxes and polystyrene trays. Many companies sell bespoke fruit storage containers for different types of fruit. Fruit will store well as it comes, but it will store better if it is wrapped. You can wrap your fruit in polythene bags (ensuring they are pierced and kept in low temperatures to prevent condensation). Tissue paper and newspaper also make good wrappers, especially for apples. Simply take a piece of newspaper or tissue paper and wrap it around the apple, and place it in a cool, ventilated container. However you store your fruit, you should check it regularly. 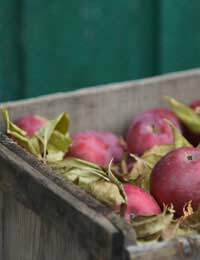 One rotten apple can spoil the whole batch, so removing it quickly could save your crop. If you do find rotten fruit, it could be that ventilation that is poor. If the fruit appears to be shrivelled, the temperature could be too high or the atmosphere too dry. Encourage humidity by damping down the floor occasionally, or store fruit in polythene bags. Apples should be picked when ripe, and handled gently. Early season apples don’t store well, mid season fruit can store for up to five weeks, and late season ones store for several months, and taste better as a result. Wrap individually in tissue paper or newspaper, and store on slatted shelves, on fruit trays or in well-ventilated boxes. Store apples that ripen at different types separately, and avoid touching them with your fingers, as any small bruising can lead to them becoming rotten. Pears should be harvested when still firm and handled gently. They can damage easily, so check them thoroughly for bruises before storing. They don’t benefit from being wrapped, so lay them in a single layer on slatted shelves or storage trays. Store for a few weeks only, they go off quicker than apples, but they’ll need to finish off the ripening process before eating them. A week before you’re ready to eat them, move the pears into a warm area so they ripen up, and eat within a few days. Storing fruit is a great way to deal with large harvests, and see you through the winter months. As long as you check it regularly for signs of damage, you should be able to keep fruit for several weeks, if not months. @Lotti - I think it's even difficult with fruits like blueberries and stawberries as they go soggy in the fridge and taste awful frozen. Carrots shouldn't be that difficult as long as they are left whole and not choopped as then they dry out. There's not much you can do with cucumber as it tends to get soggy really quickly from the inside out. Good ventilation is always best and keeping fruit separated and away from each other will stop mould spreading from one to the other. Good luck. Hi. I am currently trying to loose weight and am also mobility impaired. I've been trying to portion fruits and veggies to store in the fridge so I have an easy to grab snack. I've been fine with things like cherry tomatoes, celery, grapes, blueberries and. Strawberries (I've been storing them in small zip lock bags.) but raspberries, cucumber, carrots and such have not fared quite so well.what is the best way to store portioned fruits and veggies to give them the best life in the fridge. Should I change to small tubs? Hi everyone, I have loads of bottled blackberries and have run out of jam! Is it possible to make jam out of bottled fruit?